The Portable Veblen is a unique story about marriage, family and identity. The book opens with Veblen (named after a Norwegian economist and sociologist) accepting a bumbling proposal from the sweet-seeming Paul, who surprisingly turns out to be a neurologist. It's a story about the complexities of relationships and family and that inescapable task of having to blend the bride's family and baggage with the groom's family and baggage. 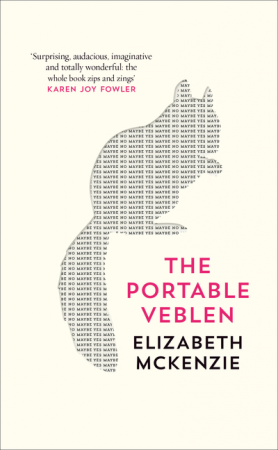 Growing up with an overbearing, Dickensian hypochondriac mother, a father in a psychiatric institution and a no-waste culture of unspecified guilt, metaphorical debt and carer responsibilities, Veblen gives the impression of an overgrown child. She's suffered her mother's whims and tempers, her perceived illnesses, her wounded pride. Veblen has never been anybody's first priority and has spent her life so far pacifying her tempestuous mother and henpecked stepfather. Her mum expects a lot from Veblen, whom she considers to be one of the only decently-raised people on the planet. Never finishing college, a professional temp, amateur translator and secret expert on squirrels and Thorstein Veblen, namesake Veblen has never really been able to forge her own identity, so instead has complied a mixture of tics, obsessions and fascinations to form herself upon. She is coming to terms with her impending marriage and is anxiously worrying about whether her world-view is compatible with Paul's, whether their families will get along and whether or not she is lovable and she's worried that practical Doctor Paul is too dismissive of her whimsical attachments to squirrels. The book follows Paul and Veblen in their attempts to combine their families, to find some sort of common ground on which they can agree to a wedding, and it provides a bit of back story into why the two characters are like they are- it's news to them too, as they freely admit that they don't know an awful lot about one another. My favourite bit of the whole novel was young Paul's childhood escapade with the screaming snails and the science fair, and the getting accidentally high on spiked cider and fumbling around in the woods with his middle school girlfriend. That was the only part of the book that seemed real and seemed to carve out a real time and place. The rest of the book felt like a weird fairytale, complete with overgrown cottage, the villainous witch and the furry-loving princess.There is a prominent plot thread concerning Paul's invention of some sort of cranial hole punch to perform field-based neurosurgery for the military- so Veblen's musings on the happiness-based, anti-consumerist social values of Thorsetin Veblen are contrasted against a stark background of medical ethics, corporate corruption, biotechnology and the whole messy relationship between big cooperation, the medicine industry and the military in america. I couldn't understand what this book was trying to do. Was I supposed to laugh? Is it serious? Is it literary fiction's answer to chick lit? I'm not sure that's a thing. I didn't know if I was supposed to believe that Veblen could talk to squirrels or not, or whether believing she could commune with rodents was one of her coping mechanisms for a gently traumatic childhood. Part of me just wanted to shake her and tell her to get a grip. I don't mind a free spirited protagonist, but Veblen was vague and dreamy to the point of frustration and was steering very, very close to Manic Pixie Dream Girl territory. She's incapable of making up her mind, alternates between trying to please everyone and being very single minded and I honestly, truly could not see how Veblen and Paul worked as a couple. I'm not saying couples need to have the same interests and world-views and politics on everything- but aside from resenting their parents for a perceived lack of attention (Paul due to a disabled older brother, Veblen due to her mother's self-obsession/hypochondria) they had literally no common ground at all. Paul wants a load of money, stuff and an impressive house as a middle finger to his hippy parents, Veblen wants a simple, happy life with minimal waste and much quirk. It's not the sort of thing that I'd probably recommend as it's not my usual style- to be honest I'm surprised it made the shortlist when there were other such thought provoking novels to choose from.